We are aware of dam and its uses. None of the dams in our country are automated till now and is operated manually. It is manually opened and closed. In this case physical presence of person(s) is a must at the dam during flood which is not safe. We, in our country are slowly progressing in this field of automation compared to developed countries. Many dams in our country are not even motorised. The operator(s) manually rotate a lever to open or close. Few dams are motorised which are operated by simply pressing a button to open or close. Flood situation is one of the alarming factor which requires close and continuous monitoring as it is life threatening issue. Right decision has to be taken in right time to avoid huge loss of life as well as valuables. Much time should be taken for communicating the information(s) and execution ( to open or close ) the dam. Our system of automatic controlling of flood situation is appreciable as it not existing anywhere in our country. In this system the flood status is automatically intimated to the concern persons mobile number where ever he is. As it is GSM based we have this service all 24 hours and 365 days a year irrespective of day or night. The block diagram consists of Embedded Microcontroller, relay driver, relay, valve, Ultrasonic Sensor, buzzer, GSM modem, power supply etc. Landmines and unexploded ordnance (UXO) are a legacy of war, insurrection, and guerilla activity. Landmines kill and maim approximately 26,000 people annually. In Cambodia, whole areas of arable land cannot be farmed due to the threat of landmines. United Nations relief operations are made more difficult and dangerous due to the mining of roads. Current demining techniques are heavily reliant on metal detectors and prodders. · Metal detectors--- capable of finding even low-metal content mines in mineralized soils. · Nuclear magnetic resonance, fast neutron activation and thermal neutron activation. · Thermal imaging and electro-optical sensors--- detect evidence of buried objects. · Biological sensors such as dogs, pigs, bees and birds. · Chemical sensors such as thermal fluorescence--- detect airborne and waterborne presence of explosive vapors. In this discussion, we will concentrate on Ground Penetrating Radar (GPR). This ultra wide band radar provides centimeter resolution to locate even small targets. There are two distinct types of GPR, time-domain and frequency domain. Time domain or impulse GPR transmites discrete pulses of nanosecond duration and digitizes the returns at GHz sample rates. Frequency domain GPR systems transmit single frequencies either uniquely, as a series of frequency steps, or as a chirp. The amplitude and phase of the return signal is measured. The resulting data is converted to the time domain. GPR operates by detecting the dielectric contrasts in the soils, which allows it to locate even non metallic mines. In this discussion we deal with buried anti-tank (AT) and anti-personnel (AP) landmines which require close approach or contact to activate. AT mines range from about 15 to 35 cm in size. They are typically buried up to 40cm deep, but they can also be deployed on the surface of a road to block a column of machinery. AP mines range from about 5 to 15cm in size. AT mines which are designed to impede the progress of destroy vehicles and AP mines which are designed to kill and maim people. The impulse GPR system developed in the International Research Centre for Telecommunications-transmission and Radar (IRCTR). Impulse GPR system comprises a Impulse generator, Transmitter, Receiver, Pulse extender, A/D converter, Processor and Visual display. The pulse generator delivered by SATIS Co. produces 0.8 ns monocycle pulses. The unique feature of this generator is its small trailing oscillations, which are below 2.4% of maximum amplitude during the first 2 ns and below 0.5% afterwards. The advantage of a monocycle in comparison with a mono pulse is that the frequency spectrum of the first one decreases to zero at low frequencies, which cannot be efficiently transmitted via the antenna system, while the frequency spectrum of the second one has a global maximum there. As a result, the magnitude of the field radiated by an antenna system fed by a monocycle is considerably larger than the magnitude of the field radiated by the antenna system fed by a monopulse with the same magnitude. The generator spectrum covers a wide frequency band from 500MHz till 2GHz on 3dB level. At frequencies below 1GHz, attenuation losses in the ground are small and considerable penetration depth can be achieved. However, landmines detection requires down-range resolution of the order of several centimeters, which can be achieved using frequencies above 1GHz. It was found experimentally that the 0.8ns monocycle satisfies penetration and resolution requirements. This output signal from 0.8ns generator is shown in figure. The spectrum of this pulse has a maximum at frequencies where the attenuation losses in the ground start to increase. So the spectral content of the monocycle below this maximum penetrates deep into the ground and the spectral content above this maximum provides sufficient down-range resolution. Radiate short ultra-wide band (UWB) pulse with small ringing. Radiate electro magnetic energy within a narrow cone in order to filter out undesirable back scattering from surrounding objects. Produce an optimal footprint on the ground surface and below it. The waveform of the radiated field on the surface and in the ground should be the same. The waveform of the radiated field in the ground should not depend on type of the ground. · Allow time windowing to isolate the direct air wave from the ground reflection. · Provide sufficient sensitivity in order to receive very weak fields. · Receive the field in a local point; effective aperture should not be larger than 1cm2. · Be elevated at least 10cm above the ground surface. Additionally a possibility to measure simultaneously backscattered field in two orthogonal polarizations is desirable. Pulse extender will amplify the ground reflection signal up to the maximum level acquired by A/D converter. The transmitter sends out a series of electromagnetic pulses then listens with the receiver connected to high speed sampler which in turn feeds A/D Converter. A dielectric anomaly in the soil may cause the signal to be reflected back to a separate receiver antenna. This information is converted from nanoseconds to milliseconds so that it may be digitized by a conventional A/D converter for processing and display. The center frequency and band width of the transmitted pulse can be varied by changing the antenna and are chosen with respect to the required depth of penetration, soil type and size of the object to be detected. In this experiment, we used antennas with a center frequency 1.4GHz and 80% band width. The precision of sampling converter is sufficiently high to do accurate measurements of scattered transient field. This A/D converter 12 bit accuracy. This provides 66 dB linear dynamic ranges. A/D converter converts the signal into digital signal which passes to the processor. 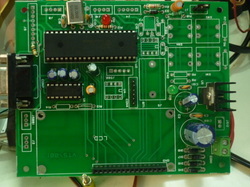 A/D converter converts the signal into digital signal which passes to the processor. Processor filters the signal. This signal shows presence or absence of surrogate mine in the soil. Processor allows passing the presence of mine detecting signal. Processor selects the mine detecting signal and passes to the visual display. Visual display helps to see the range of targets. It displays the exact position of landmine. If all mines were cased or had substantial metallic content, all that would be required for detection are metal detectors. The widespread use of plastic landmines necessitates development and deployment of additional detection technologies. Because there is no such thing as a plastic detector, other sensors attempt to exploit ancillary disturbances in the background, such as thermal, chemical, or dielectric. Because of the difficulty detecting the tiny amounts of metal in a plastic landmine with a metal detector, technology development has been funded in other areas. Ground penetrating radar (GPR) has been used for nearly 70 years for a variety of geophysical subsurface imaging applications including utility mapping and hazardous waste container location and has been actively applied to the problem of landmine detection for nearly 20 years. When parameters such as frequency range, antenna size, antenna separation, and system timing are optimized for detection of mine-sized objects in the near subsurface, GPR is quite effective in detecting both metal and plastic landmines in a variety of soils. The depth of penetration is a function of both the frequency range produced and the soil attenuation. Lower frequency components penetrate further, but it is a higher-frequency component that is necessary to image and resolve smaller targets. Both impulse- based and swept frequency GPR systems have been employed in Army-sponsored research programs. Generally a system with a bandwidth of roughly 1 to 4GHz is effective for detection of landmines. Ultimately, GPR images the dielectric properties of the soils, and any discontinuities appear as a signal. If soil were perfectly homogeneous, a discontinuity caused by a land mine would stand out as an anomaly against the background. Unfortunately, even under near-ideal test track conditions, soil itself is a remarkably inhomogeneous medium, and false alarms are easily generated from the background itself . Because of this, automatic target recognition (ATR) algorithms employed by impulse-based GPR systems typically calculate and remove background and try to detect the hyperbolic signatures that are characteristic in size and shape of landmine targets in GEO-CENTERS 400 Series energy in focusing ground penetrating radar (EFGPR), we employ a fuzzy logic-based algorithm that use prototypes, or feature sets, for landmines, and prototypes than to clutter. At each location in a data set, we look inside a neighborhood of adjacent points, extract a feature set, and calculate if the features set is closer to the mine prototypes .The output is a plan view of the confidence, at each point along a test lane, that there is a lade mine .A blob detector then runs on this confidence plane view, outputting target reports when a blob is of an appropriate size and shape. Although GPR has been shown to be effective on the test track against a variety of land mines in a range of soil conditions, it is technologically complex . The weight and power requirements are not overwhelming, but they make GPR most easily deployed on a vehicular platform .Through NVESD at Fort Belvoir, the U.S Army is deploying GPR in a variety of hand held and vehicular land mine detection technology development programs . A series of measurements has been taken using a set of targets buried in the various types of soil. An FR-127-MSCB impulse ground penetrating radar (ImGPR) system developed by the Commonwealth Scientific and Industrial Research Organization (CSIRO), Australia, has been used for these measurements. The system collects 127 returns, or surroundings, per second, each composed of 512 samples with 12 bit accuracy. The sounding range may vary from 4 ns to 32ns. The GPR system uses bistatic bow-tie antennas which transmit wideband, ultrashort duration pulses. The GPR unit is suspended above the ground surface at a height of between 0.5 to 2cm. Its motion is controlled by a stepper motor unit running along a track at a constant velocity as shown in fig.4. Since the motion of the GPR is controlled by a stepper motor, with constant speed, running on a straight track, these samples corresponds to distances from starting point of the run. GPR images the dielectric properties of the soil and any discontinuities appear as a signal. If the soil were perfectly homogeneous a discontinuity caused by a land mine would stand out as an anomaly against the background. Automatic targets recognition (ATR) algorithms employed by impulse based GPR system. The measurements form a two dimensional matrix, referred to as a radargram or B scan and A scan are used for visual inspection of data on the acquisition computer and in laboratory analysis. Impulse GPR produces measurements of electromagnetic field scattered from the subsurface. This is detecting the graph as shown in figure. A scan is a method for detecting the presence and absence of surrogate mine in clay soil. The electromagnetic field is scattered by the GPR. Scattering pulses are detecting by the graph. This graph is Amplitude Vs Time. This graph is helpful to find the landmine and is used for visual inspection. The normal pulses are showing the absence of mines. The amplitude of the pulses are large as compared to other area. This shows the presence of mine. So we can detect the presence of mine in that clay soil. A scan shows the presence of mine but we cannot expect the exact target. This problem is solving in B scan. B scan or Radargram is used to visualize the target of surrogate mine. A sample radargram is shown in figure. This showing the targets at approximately 55 cm and 100 cm. B scan calculating the distance from the soil to the mine. In this sample radargram showing the exact position. A scan and B scan is used for laboratory analysis. A return at a certain position along the distance axis is called an A scan. B scan is a graph which is Time delay Vs Distance. So B scan helps to calculate the penetration length. This graph helps to calculate the distance from ground to the mine. US army handheld standoff mine detection system that is a self propelled cart with GPR system. As technological development for land mine detection tends to be a vehicular based system. This vehicular based system is shown in figure. 7. This vehicle is self propelled so it can use in war places. This is a vehicular based system because vehicle can carry the weight and supply the power. This does not mean, though, that handheld systems are limited to metal detectors. There are platforms that are smaller than full vehicles but larger than man deployable devices. This vehicle comprises a pulse generator, transmitter, receiver, pulse extender, A / D converter, processor and a visual display. This vehicle is passing through the soil, the pulse generator produces pulses and the transmitter transmits this signal to the ground. The soil contain the land mine, the receiver receives the ground reflecting signal. The A / D converter converts the signal nanoseconds to milliseconds. This signal is digital signal and this signal amplifies and filtering by the processor. The signal contains presence of land mine, passes to the visual display. This visual display helps to display the exact target of land mine. This helps to calculate the distance from the soil to the mine. This system is very useful to the war places. This vehicle is self propelled so it can make easy detection. The U.S Army performs objective blind and scored testing at their testing facilities, which include carefully constructed mine lines. In this testing and evaluation environment, land mines are live (filed with explosive) because certain detection technologies such as Quadrople Resonance rely on detection of the actual explosive charge. However, on this test lines, the mines are unfused and thus do not detonate if they are run over by detection system. Dirt and gravel lanes are maintained. Typically, the lanes are very smooth, largely free of bumps and ditches that would cause the sensor arrays to maintain an inconsistent sensor height that would substantially affect data quality. Off-road lanes are also used. They are not as pristine as dirt or gravel lanes but are still a substantially more controlled environment than a Jeep train through the Khyber Pass. Each lane has an associated calibration lanes where the ground truth is known and contactors may run and rerun their system to iteratively optimize detection performance. GPR systems typically need calibration or timing alignment, and infrared cameras generally need bore sighting. The feature extraction and ATR algorithms on the individual sensor subsystems usually need to be tweaked to maximize the detection rate and minimize the false alarm rate for the particular environment. This can entail adjusting detection thresholds or determining optimum blob sizes. When acceptable performance is achieved on the calibration lane, the contractor is ready to run the blind, scored section of the lane. · GPR has accurate measurements. · GPR locates even small targets. · It has been well founded by the defense. · GPR operates by detecting the dielectric soils which allows it to locate even no metallic mines. · Biological sensors can only operate for limited periods, but in GPR has no such limits. · GPR has been tested in different environmental conditions. · The sensor such as GPR is larger and heavier. · GPR is more power hungry. · GPR can suffer falls alarm rates as high as metal detectors. Impulse GPR system is using for detecting anti-tank and anti-personal mines. Anti-tank mines are using for destroying the vehicles and anti-personal mines, which are designed to kill and maim people. Currently, very little technology is used in real-world demining activities. Active programs by the U.S Army in both land mine detection sensor development and systems integration are evaluating new technologies, incrementally improving existing technologies, increasing the probability of detection, reducing the false alarm rate, and planning out useable deployment scenarios. Through iterative design, build test cycles, and blind and scored testing at Army mine lanes, steady progress is being made. Vehicle skid can be defined as the loss of traction between a vehicle’s tyres and the road surface due to the forces acting on the vehicle. Most skids are caused by driver error, although only about 15% of accidents are the direct result of a vehicle skidding. Skids occurring in other accidents are usually the result of last minute action, by the driver, when faced with a crisis ahead rather than actually causing an accident. Skids can occur both in the dry and wet as well as icy conditions, however, the chances of losing control and having an accident increases by 50% in the wet. The most common type of skid we will be confronted with is when the rear end of the car slides out, causing an over steer or when the front of the car plows toward the outside of a turn without following the curve of the turn causing an under steer. Usually, over steer occurs as a result of going into a corner too fast or incorrectly hitting a slick area, causing the rear wheels to over steer. A third skid called the four wheel skid can also occur, where all the four wheels lock up and the vehicle slides in the direction where the forward momentum is carrying it, with no directional control. To counter these skids and to prevent accidents from happening, Vehicle Skid Control (VSC) is incorporated in the vehicle. Vehicle Skid Control (VSC) takes the safety aspects of the driver and the vehicle to the next level. It comes under the category of “Passive Technology”, which helps you to avoid a crash. Vehicle Skid Control (VSC) senses the onset of traction loss and helps the driver stay on track. This is achieved via the system's ability to reduce engine power and to control the brake actuator. VSC helps the driver maintain vehicle traction under demanding conditions by detecting and helping to correct the wheel spin. VSC uses a variety of sensor input to determine if the car is losing traction, then applies the brakes to individual wheels to help correct for discrepancies. The system will also back off the throttle to reduce power. VSC integrates traction control to limit rear wheel spin on slippery surfaces. The VSC system electronically monitors speed and direction, and compares the vehicle's direction of travel with the driver's steering, acceleration and braking input. VSC can help the driver compensate for loss of lateral traction, which can cause skids and loss of vehicle control. Mentally, driving is a highly demanding activity - a driver must maintain a high level of concentration for long periods and be ready to react within a split second to changing situations. In particular, drivers must constantly assess the distance and relative speed of vehicles in front and adjust their own speed accordingly. Those tasks can now be performed by Adaptive Cruise Control (ACC) system, which is an extension of the conventional cruise control system. Like a conventional cruise control system, ACC keeps the vehicle at a set constant speed. The significant difference, however, is that if a car with ACC is confronted with a slower moving vehicle ahead, it is automatically slowed down and then follows the slower vehicle at a set distance. Once the road ahead is clear again, the ACC accelerates the car back to the previous set cruising speed. In that way, ACC integrates a vehicle harmoniously into the traffic flow. a) Harsh or sudden acceleration. b) Excessive or sudden braking. c) Coarse or jerky steering movements. d) Over steer and under steer. 1) The front wheel skid. 2) The rear wheel skid. 3) The four wheel skid. The car tends to take a course outside of the expected course that the driver has steered (under steer); see figure 1. If the front tyre approaches the traction limit more rapidly, the effect is that the front of the car takes a wider radius curve than the driver intended. The car is said to under steer. Excess speed on entry to a hazard i.e. a corner or bend, or sudden braking to reduce the speed when negotiating the hazard. Both of these actions will have the effect of destabilizing the vehicle making it more vulnerable to a loss of control. The rear of vehicle swings out of line and gives the impression of trying to overtake the front (over steer); see figure 2. If the rear tyres approach their traction limit more rapidly than the front, then the effect is for the rear of the car to steer a wider path than the front wheels. This rotates the car more than the driver intended and, if nothing is done, leads to the car turning a smaller radius corner. When this occurs the car is said to over steer. As with the front wheel skid, excessive speed into the hazard and sudden braking or acceleration with a rear wheel drive vehicle, destabilizing the vehicle, are the main causes of this skid. All four wheels have locked up and the vehicle is sliding in the direction that the forward momentum is carrying it, with no directional control; see figure 3. Both front and rear wheel skids, if unchecked sufficiently early, can develop into four wheel skids. As the name implies, under steer occurs when the front slip angle is greater than the rear and the car goes straighter rather than following the intended turn. The slip angle, or yaw angle in technical terminology, is the angle between where the car is pointing and the intended path. The yaw moment is the rate at which the yaw angle is changing. The higher the yaw moment, the more likely it is that the driver is losing control. At the same point, the front wheel may start to grip less even when the steering is turned sharply and as a result the car continues in more of a straight line than a sharp turn. Here in this case, the skid control system brakes the inside rear wheel, effectively tightening the car’s line. By applying the brakes, the car slows down which further helps stabilize it. Over steer, on the other hand, occurs when the rear tyres have a greater slip angle than the front tyres and the back threatens to overtake the front, causing the vehicle to spin. In other words, if the rear tyres approach their traction limit more rapidly than the front, then the effect is for the rear of the car to steer a wider path than the front wheels. This rotates the car more than the driver intended and, if nothing is done, leads to the car turning a smaller radius corner. When this occurs the car is said to over steer. Here the skid control system brakes the outside front wheel to reduce over steer, effectively pulling the tail back into line. Stability control systems or skid control systems with names like StabiliTrak, Dynamic Stability Control, Stability Management, and Vehicle Skid Control are the latest advancement in vehicle safety. Regardless of the different names, they all perform the same task – to sense the onset of traction loss and keep the driver on track. These systems are designed to deliver transparent intervention the moment the situation becomes unstable. A vehicle skid control system actually detects when a driver has lost some degree of control. It then automatically stabilizes the vehicle to help the driver regain control. Vehicle Skid Control (VSC) takes the safety aspects of the driver and the vehicle to a completely new level. These skid control systems are often integrated with the engine management system to cut power in even more tricky situations. This scenario is a complex system of sensors and microprocessors that continually monitor the vehicle for any signs of instability. Once detected (usually in the form of a slide or skid), the system automatically applies selective braking to specific wheels thereby stabilizing the vehicle. This split-second intervention often happens so quickly that it is over before drivers even realize they were in danger of losing control. By gently stabilizing the car at the critical moment, control is returned to the driver with minimal fuss and alarm. Luxury cars, such as the Mercedes Benzes, BMW, Lexus, etc. now sold in India, have stability systems installed that are designed to remove over steer or under steer. Yaw rate sensors measure a vehicle's angular velocity about its vertical axis in degrees per second or radians per second. These instruments use gyroscopes to monitor the slip angle, the angle between the vehicle’s heading and actual movement direction. The main application of these sensors is to determine the orientation of the vehicle as it starts to roll over. Yaw rate sensors play a key role in electronic stability control systems. Piezoelectric: This type of sensor consists of a tuning fork shaped structure containing four piezo elements, two on the top and two below. While driving on a straight path, the upper piezo elements do not generate a voltage due to no existing Coriolis force. In case of cornering, the orientation movement causes the upper division of the tuning fork to leave the oscillatory plane, which generates a voltage proportional to the yaw rate and oscillatory speed. The polarity of the voltage is determined by the cornering direction (left or right). Micromechanical: In this type of sensor, a micro mechanical capacitive acceleration sensor is placed on an oscillating element. This measured acceleration is proportional to the product of yaw rate and the oscillatory velocity. In order to function, the DSC system requires the overall steering wheel angle. The overall steering wheel angle is measured by the steering angle sensor. As the software could not be accommodated on the DSC control unit for reasons of processor capacity, a separate control unit with its own fault memory has been developed. The steering angle sensor is mounted on the steering shaft. The steering-angle sensor has two potentiometers offset by 90°. The steering-wheel angle determined by these two potentiometers covers one full steering-wheel turn; each of these values is repeated after +/- 180°.The steering angle sensor knows this and counts the steering-wheel revolutions accordingly. The overall steering wheel angle is thus made up of the current steering wheel angle together with the number of steering wheel rotations. In order that the overall steering wheel angle is available at any time, uninterrupted detection of all steering wheel movements - even when the vehicle is stationary - is required. In order to achieve this, the steering angle sensor is permanently supplied with power from Terminal 30.This means that steering wheel movements are also detected with ”ignition off”. The steering angle detected by the potentiometers remains available even after interruptions to the power supply; the number of steering wheel revolutions, however, is not. In order that the steering angle sensor remains functional after power supply interruptions, software that calculates the number of steering wheel rotations on the basis of the speed of rotation of the road wheels (and, on some models, the steering wheel being turned from lock to lock) has been integrated. This process is referred to as initialization or imposition. If imposition does not succeed by the time a speed of approx. 20 km/h is reached from a standing start, the DSC is switched to passive mode, the DSC warning lamp comes on, and a fault is recorded on the DSC control unit. The imposition process is performed whenever the ignition is switched on if the number of steering wheel revolutions is not available. Four-wheel drive vehicles are an exception to this rule: The DSC system is immediately switched to passive mode and a fault entered in the DSC control unit memory if there has been an interruption in the power supply to the steering angle sensor. In contrast with conventional-drive vehicles, the imposition process is then not aborted on reaching a specific road speed, but rather continued until the DSC is receiving correct steering angle data. At that point, the DSC warning light goes out and the DSC is operational again. In both cases, there is no fault recorded on the steering angle sensor. As an additional safety measure, the DSC control unit calculates the steering angle on the basis of the speed of the road wheels and compares it with the information supplied by the steering angle sensor. This plausibility check prevents the vehicle operating on the basis of incorrect calibration. An incorrect zero position can result from incorrect calibration or alteration of the steering geometry as a result of damage or repairs. Another safety factor is precise assignment of sensor to vehicle. During calibration, the VIN number is stored in the EEPROM and then compared with the VIN number received from the instrument cluster whenever the ignition is switched on. After replacing the steering-angle sensor, it must first be coded and then calibrated using the ABS/DSC diagnostic program. In order to perform its internal calculations, the steering angle sensor requires model-specific data which has to be loaded onto it by means of coding. Calibration permanently stores the current steering wheel position as the straight-ahead position in the steering angle sensor EEPROM. Therefore, the front wheels and the steering wheel must be set exactly to the straight-ahead position before calibration. In addition, the vehicle identification number is also read from the instrument cluster and stored permanently in the steering angle sensor EEPROM. On successful completion of calibration, the steering angle sensor fault memory is automatically cleared. The steering angle sensor is permanently supplied with power from Terminal 30 which also has its own fuse. In addition, the steering angle sensor also receives a power supply from Terminal 87 or, depending on model, from Terminal 15. This supply is brought via a different fuse. _ when a fault is detected after “ignition off” the frequency counter is incremented upwards by”1”. The maximum value is”31”. _ if the fault no longer occurs during the next trip, the frequency counter is reduced by”1”. The minimum value is”0”. The throttle cable has almost become redundant on today’s motor vehicle. The drive-by wire system is by no means a new concept as it was introduced by BMW on their 7 series range back in 1988. The system BMW use is referred to as EML (German term for electronic throttle control). The system has now found its way onto other vehicles with humbler routes and can be found on base models. Historically a mechanical linkage between the accelerator pedal and the throttle butterfly has always existed, be it via a cable or via rods and linkages. These have now been replaced by sophisticated electronic control modules, sensors and actuators. This system is also referred to ‘Fly-by-Wire’. The vehicles on board electronic systems are able to control all of the engine’s operation with the exception of the amount of incoming air. The optimisation of the air supply will also ensure that harmful exhaust emissions are kept to an absolute minimum and drivability is maintained, regardless of the circumstances. Coupling the electronic throttle actuation to the adaptive cruise control, traction control, and idle speed control and vehicle stability control systems also means finer control can be achieved. Eliminating the mechanical element of a throttle cable and substituting it with fast responding electronics, reduces the number of moving parts (and associated wear) and therefore requires minimum adjustment and maintenance. Greater accuracy of data improves the driveability of the vehicle, which in turn provides better response and economy. Yaw rate sensors detect changes in the car's rotation in a left or right direction. It keeps track of the direction in which the car is moving relative to which way the driver is turning the steering wheel. When the sensors detect under steer or over steer, a computer takes over and applies brakes or controls power to one or both the drive wheels, so that the car comes under control. The system is programmed to respond to a wide variety of scenarios and is so selective that it can apply only the brake on one specific wheel if that's what is needed to regain control. The G-sensor or gravity sensor determines if the car is accelerating or decelerating, cornering and braking forces simultaneously while the car is on the move and accordingly controls the throttle. Steering angle sensor evaluates the direction and rate of change in steering wheel movement. Electronic throttle control reduces the throttle for 1/7th of a second, to control the wheel spin, when the front or rear wheels lose traction. Slip indicator alerts the driver that the tyres are about to exceed the grip limit. The central processing computer monitors the steering movement together with either taking over and applying brakes or controlling the power to one or both the drive wheels. The heart of all these systems is a central processor that takes information from a number of sensors, and then determines whether the car is in a stable or unstable state. By combining the data’s from ABS sensors (for wheel speed), steering angle sensors, yaw sensors (measuring the amount a car fishtails, or rotates around its vertical centre axis), and lateral force sensors (measuring the amount of sideways g-force generated by the car), the central processing unit can actually detect when a vehicle is behaving in a way contrary to how the driver intends. VSC also includes a slip indicator with a warning sound and light to alert the driver that the tyres are about to exceed the grip limit. If the processor does detect instability such as a slide produced by a sudden swerve, it automatically applies light brake pressure to a select wheel (or wheels) to maintain or restore control. Here, the VSC computer uses engine throttle control and individual wheel braking to help counteract skidding and spinning. The high-speed computer constantly compares the driver's intentions, as indicated by steering wheel, throttle and braking activity, with the car's actual motions measured by the various sensors. If they do not correlate, the VSC computer selectively applies individual wheel brakes and/or momentarily reduces engine power as necessary to help the driver regain the intended direction of travel. For example, if the car were tending to continue straight rather than responding to the driver's right turn of the steering wheel, VSC would typically reduce engine power and would apply the right front brake momentarily to help the car follow the intended path. Once proper vehicle attitude is restored, VSC returns to a standby state. When VSC is active, a warning beep tone and instrument panel warning light indicate that the system is functioning. In many cases, VSC reacts well before the driver is aware of a loss of lateral traction. A VSC shutoff button deactivates VSC and electronic traction control for use. At all other times, VSC remains on and functioning. VSC differs from Anti-lock Braking System (ABS) technology. ABS prevents vehicle wheels from locking, decreases the distance required to stop and improves a driver's control during emergency braking on wet and slippery roads whereas VSC is intended to help a driver maintain the intended direction of travel, even when the brakes are not applied. However, VSC and ABS compliment and work in close coordination with each other in stability control system, providing enhanced driver control in a broad range of situations.VSC can help provide a measure of control in real-world situations faced by even the most careful and experienced drivers. VSC senses the onset of traction loss and helps the driver stay on track. This is achieved via the system's ability to reduce engine power and to control the brake actuator. 8.1. WHY ADAPTIVE CRUISE CONTROL? Comfortable distance to the car ahead increases driving safety and ensures a more relaxed driving experience. Adaptive Cruise Control ensures that there is enough distance to the car ahead, even if it unexpectedly lowers the speed. With Adaptive Cruise Control we have enhanced the conventional systems for speed control to a driver assistant with an added value. The system makes it possible to adapt the distance to the car ahead without the driver’s intervention, effectively relieving the driver. Highway and rural road drives are more relaxed and traffic flows better altogether, since acceleration and braking manoeuvres are automatically adjusted. The 77-GHz Auto cruise radar system made by TRW has a forward-looking range of up to 492 feet (150 meters), and operates at vehicle speeds ranging from 18.6 miles per hour (30 kph) to 111 mph (180 kph). Delphi's 76-GHz system can also detect objects as far away as 492 feet, and operates at speeds as low as 20 mph (32 kph). Adaptive Cruise Control (ACC) technology improves upon the function of standard cruise control by automatically adjusting the vehicle speed and distance to that of a target vehicle. ACC uses a long range radar sensor to detect a target vehicle up to 200 meters in front and automatically adjusts the ACC vehicle speed and gap accordingly. ACC automatically decelerates or accelerates the vehicle according to the desired speed and distance settings established by the driver. As per standard cruise control the driver can override the system at any time. Figure: THE CONCEPT OF ACC. 8.3. HOW DOES IT WORK? The radar headway sensor sends information to a digital signal processor, which in turn translates the speed and distance information for a longitudinal controller. The result? If the lead vehicle slows down, or if another object is detected, the system sends a signal to the engine or braking system to decelerate. Then, when the road is clear, the system will re-accelerate the vehicle back to the set speed. The adaptive cruise control (ACC) system depends on two infrared sensors to detect cars up ahead. Each sensor has an emitter, which sends out a beam of infrared light energy, and a receiver, which captures light reflected back from the vehicle ahead. The first sensor, called the sweep long-range sensor, uses a narrow infrared beam to detect objects six to 50 yards away. At its widest point, the beam covers no more than the width of one highway lane, so this sensor detects only vehicles directly ahead and doesn't detect cars in other lanes. Even so, it has to deal with some tricky situations, like keeping track of the right target when the car goes around a curve. To deal with that problem, the system has a solid-state gyro that instantaneously transmits curve-radius information to the sweep sensor, which steers its beam accordingly. Another challenge arises when a car suddenly cuts in front of an ACC-equipped car. Because the sweep sensor's beam is so narrow, it doesn't "see" the other car until its smack in the middle of the lane. That's where the other sensor, called the cut-in sensor, comes in. It has two wide beams that "look" into adjacent lanes, up to a distance of 30 yards ahead. And because it ignores anything that isn't moving at least 30 percent as fast as the car in which it is mounted, highway signs and parked cars on the side of the road don't confuse it. Information from the sensors goes to the Vehicle Application Controller (VAC), the system's computing and communication center. The VAC reads the settings the driver has selected and figures out such things as how fast the car should go to maintain the proper distance from cars ahead and when the car should release the throttle or downshift to slow down. Then it communicates that information to devices that control the engine and the transmission. System on/off: If on, denotes that the cruise-control system should maintain the car speed. Engine on/off: If on, denotes that the car engine is turned on; the cruise-control system is only active if the engine is on. Pulses from wheel: A pulse is sent for every revolution of the wheel. Accelerator: Indication of how far the accelerator has been pressed. Brake: On when the brake is pressed; the cruise-control system temporarily reverts to manual control if the brake is pressed. Increase/Decrease Speed: Increase or decrease the maintained speed; only applicable if the cruise-control system is on. Resume: Resume the last maintained speed; only applicable if the cruise-control system is on. Clock: Timing pulse every millisecond. Throttle: Digital value for the engineer throttle setting. One of the biggest challenges in designing ACC systems today are the costs associated with the robust system. Though current costs are substantial, they are slowly decreasing. Auto manufacturers stress that advanced cruise control does not drive the car for you, and it's not meant to be used in heavy traffic. But, for long trips, it's a convenience that allows you to focus more on your driving. 9. When does it help? Like the safety systems that preceded it, Vehicle Skid Control is designed to step in when human input is incapable of effectively controlling the vehicle. In most cases, critical situations are the result of human error in the first place-driving too quickly, inattention, misjudgement or simply panicking in an emergency situation. In these situations, everyone can benefit from a safety system that occasionally helps regain vehicle stability, while never taking full control out of the driver's hands. After the introduction of ABS, no safety advancement has added such a high level of driving security as VSC. When used with ABS and traction control, Vehicle Skid Control significantly increases a driver's chances of recovering from potentially dangerous situations. But no matter how advanced the safety aid, the ultimate fate of a vehicle and its occupants remains in the hands of the driver. No safety system should ever be expected to protect unconditionally. So while the latest generation of stability control systems offer drivers increased protection from both themselves and the unexpected, they can never overcome poor judgement or the laws of physics. Like the safety systems that preceded it, stability control is designed to step in when human input is incapable of effectively controlling the vehicle. In most cases, critical situations are the result of human error in the first place—driving too quickly for conditions, inattention, misjudgment or simply panicking in an emergency situation. In these situations, everyone can benefit from a safety system that occasionally helps regain vehicle stability, while never taking full control out of the driver's hands. As Scott Badnoch of Cadillac is quick to point out, "The StabiliTrak system on the Cadillac is designed to improve a driver's ability to avoid accidents, but not intrude on the overall driving experience." Not since the introduction of ABS has a safety advancement added such a high level of driving security. When used with ABS and traction control, stability control systems significantly increase a driver's chances of recovering from potentially dangerous situations. But no matter how advanced the safety aid, never forget that the ultimate fate of a vehicle and its occupants remains in the hands of the driver. No safety system should ever be expected to protect unconditionally. So while the latest generation of stability control systems offer drivers increased protection from both themselves and the unexpected, they can never overcome poor judgement or the laws of physics. Maintains a consistent performance in poor visibility conditions. Alerts drivers by way of automatic braking. (i) The engine will not stall, enabling the vehicle to be moved quickly from the danger area. (ii) The link between engine (providing power) and transmission is broken; there is no drive to any of the wheels, therefore the vehicle is no longer a front, rear or four wheel drive model. (iii) A very slippery surface can cause the drive to lock up which in turn causes the wheels to lock, keeping the vehicle in a skid situation. Monitors each wheel independently maximizing the performance of the car. Increases comfort, both physical and psychological. Improves safety aspects of the car and the driver. Helps save money long term. Enhances the ability to dodge a renegade object in its pathways. Its usefulness for long drives across sparsely populated roads. This usually results in better fuel efficiency. Interconnection to more advanced future systems. Repairing cost may be high. Driving has become more and more dangerous with the ever increasing population of man and vehicles. It is estimated that 25% of all accidents are caused by driver distractions. Automotive technology is being developed every day to make our lives on the roads much safer. Vehicle Skid Control is one such instance. Safety is the principal benefit of this technology. But no matter how advanced the safety aid, we should never forget that the ultimate fate of a vehicle and its occupants remains in the hands of the driver. No safety system should ever be expected to protect unconditionally. So while the latest generation of stability control systems offer drivers increased protection for both themselves and the vehicle, they can never overcome poor judgment or the laws of physics. When we drive, it not only affects our safety but the safety of everyone around us whether driving or not. With increasing development in the field of automobiles, it is only imperative that we go for vehicles that have these technologies installed in them. Vehicle Skid Control would not, in anyway, eliminate all road accidents; however it would lower the percentage of crashes thereby lowering the number of fatalities. Despite the introduction of the system to the market place, these are still early days. The current system can measure up to 150m ahead of the car and reduce the car's speed if an obstruction appears. What it can't do, at the moment, is bring the car to a halt. Whatever happens, the ACC market looks set to explode? The projected figures make startling reading. In 2002 there are no more than 100,000 vehicles fitted with ACC, but that figure is set to reach eight million in four years' time, with Europe, South-East Asia and the US accounting for about a third each. Around 17% of all European-built cars are likely to have ACC fitted as standard by then. Expansion is bound to slow down thereafter, but by 2010 the global market will be 11.5 million units, representing an industry value of around $2.4 billion - and enormously more than that saved in repair bills, hospital bills and, indeed, funeral bills. 9. University of Michigan (July 12, 2004). U-M physicist: Smart cruise control eliminates traffic jams. Press release. 10. L. C. Davis (2004). "Effect of adaptive cruise control systems on traffic flow". Physical Review Letters E 69 (6): 066110 (article ID; no page reference). 11. CY Liang, H Peng (1999). "Optimal Adaptive Cruise Control with Guaranteed String Stability". Vehicle System Dynamics 32 (4-5): 313-330. 12. P Venhovens, K Naab, B Adiprasito (2000). "Stop and Go Cruise Control". Proc. FISITA World Automotive Congress, Seoul, Korea.